October means school holiday which means we need something to do, not just for the weekend but also for everyday of the week in the first two weeks of the month. There are already a few other articles which deal with school holiday activities, and it's impossible to include all of them here. So what I'm going to present in this month's list are the chosen list. The ones I think are going to be most fun yet meaningful. For those of you who love online research, of course you will not constraint yourself to this list and will collect as much information as possible. However for those of you who are time poor, I'm hoping this list will be one short list that helps. When: 29 Sep-11 Oct, 10am-2pm. Where: Forrest Place, Murray St, Perth. 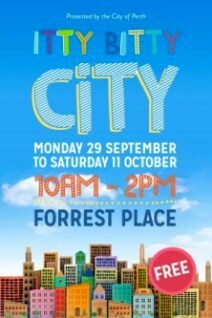 There are many activities in the City this October holiday, but there are only two which I'm going to include here. 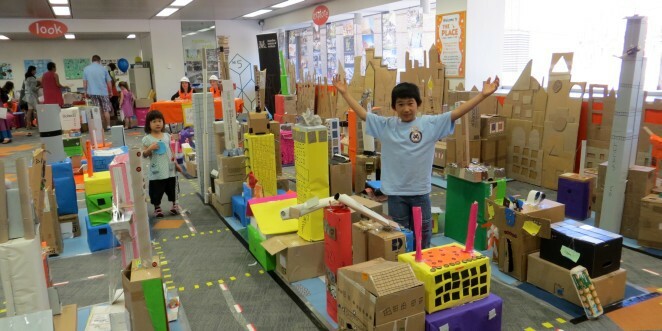 The first one is Itty Bitty City, a city made out of cardboxes which children can help build. It is very similar to Box City, an annual event held later in October. The main difference I can see from the information provided is the art side of the activity. Unlike Box City, here the children can paint their buildings and even paint an art wall, with the help of the artist-in-residence. This free use of paint understandably is not a good idea indoors, so make use of this opportunity to let your kids play with boxes and paint to their heart's content. Children are generally fascinated by fire trucks, as proven by the fact that the fire truck (albeit a pretend one) is one of the more popular rides at kids carnival. In this event, kids can discover the new interactive fire truck, dress up like a firefighter, and sit in the cab of the truck. If your child hold a City Playground Pass (can be obtained for free from the marquee at Forrest Place), s/he can also take part in a drawing competition with the theme around planning for emergencies and keeping the home safe. One lucky winner will win a prize valued at over $100. When: 4-13 Oct, various time. Now let's turn our attention to Northbridge. Perth Cultural Centre is technically included in the suburb of Perth. However more people would associate it with Northrbridge due to its proximity to William Street and Northbridge proper. This school holiday, the big event to occupy most spaces in Perth Cultural Centre, both indoors and outdoors, will be the Awesome Festival. Another article already list all the free events within this festival, so I'm not going to repeat all those here. Suffice to say that there are enough free events going around there that you can go everyday and still find something to do. When: Sun, 5 Oct, 12noon-6.30pm. I always have a fondness for Piazzarama Northbridge. They're so faithful and consistent in delivering fun activities that brighten any Sunday for families. This time around, with a theme "Heroes in Uniform," it is perhaps easy to guess who the roaming characters might be. However, there are more than just that. There will also be games and movies: Wreck it Ralph (2012, PG) at 12 noon and The Incredibles (2004, PG) at 4pm, so it's never a dull afternoon at Piazzarama Northbridge. Where: State Museum of WA, Perth Cultural Centre. Now that school holiday is over, we continue our routine as best as we can and try to fill weekends with family fun. As mentioned before, Box City is an annual event similar to Itty Bitty City but only one day every year (as part of the Architecture Week), and it's indoors. This year, it's at the State Museum, unlike in previous years where it's been conducted at the State Library of WA. So if your kids are craving for playing with boxes, head to the Museum for this one day event. Further from the city, free family activities are sprouting up too with the coming of spring. This is one fine example, where families and dogs (on leash) are welcome to come and join the fun. For our canine friends, there are Dog Wash Service, Dog Training Groups, an Agility Course, and competitions. For their human companions, i.e. ourselves, there are activities too: Bouncy Castle, Face Painting, stalls, Sausage Sizzle, and more. Blessing of the Fleet & Fireworks (Fishing Boat Harbour; 26 Oct, 3 & 8pm): A traditional and grand way to kick off the festival: with a blessing of the boats at the harbour, and a fireworks display later in the evening at the same place. Creating a Bang for the Festival (Round House; 26 Oct-9 Nov, 12.40pm): The Fremantle Volunteer Heritage Guides will be providing this short (25 minutes) performance everyday during the festival: They will tell the story of the bell in the Round House as well as other folklores, ring the bell, run a whale flag up the mast, drop the time ball and fire the cannon. Behind the Scenes Tour (Shipwreck Galleries, Cliff St, Fremantle; 26, 29 & 31 Oct, 10.30am; bookings required 9431 8469): A rare opportunity to see how WA Museum treat and conserve objects and artefacts at the Shipwreck Galleries as the one-hour tour take visitors on a private viewing through maritime archaeology and conservation work areas. There will be more events under the umbrella of Fremantle Festival in November, including the Children Fiesta and Street Parade so check out the article for next month too.